This counter-top electric pressure cooker has beauty and brains. The body and the cooking insert are stainless steel and the digital logic makes it possible to use this pressure cooker as also a rice and slow cooker. 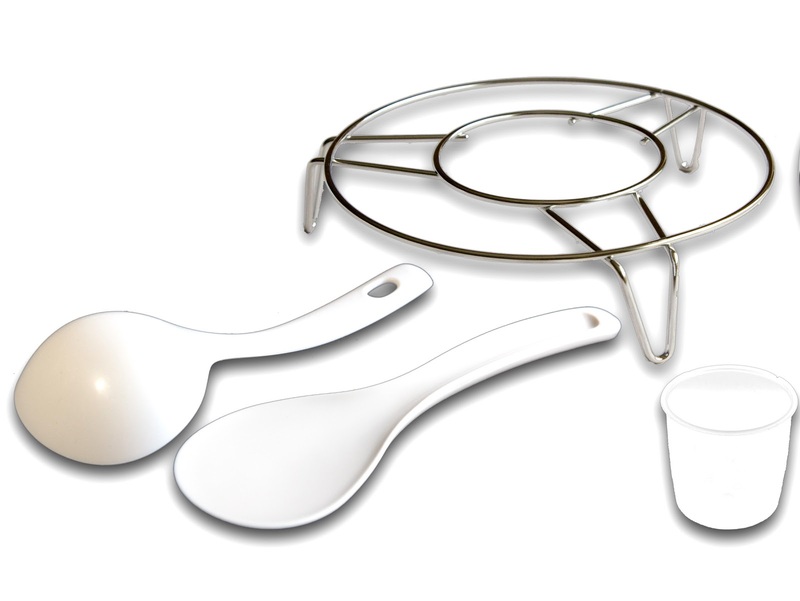 Measuring Scale– Cooking insert has a measuring scale in US cups from 2 to 10 cups. Instant Pot has an impressive list of features but -unlike many of its peers- only has one pressure setting – so we had to give it a small ding for that . However, the manufacturer shared with us that their next model (due out in the next year) will include a low-pressure setting that will operate at an average of 6.5 PSI. Electric pressure cookers as a class, are extremely safe. Unlike stove top pressure cookers that may need intervention when something goes wrong – like forgetting to turn down the heat – electric pressure cookers are able to monitor cooking and act accordingly to remedy any situation themselves. Encapsulated last–resort pressure release – Should the primary pressure regulating valve fail, the excess pressure is released into the body of the unit (between the outer lining and the inner pot). Temperature Monitor– Monitors the cooking temperature and ensures that it remains in a safe range. Also, should the temperature go beyond a safe range, the sensor turns off the heat. Should the cooker not reach pressure in a per-determined time, the temperature monitor stops heating up the cooker and switches the temperatures to “keep warm”, instead. This is to keep the food from burning. All of this is good. What we don’t like is what the cook sees during its operation. Instead of being warned that anything is amiss, the cook sees the pressure cooking time counting down just as if pressure cooking were happening normally. It is only after the pressure cooking time is finished, be it five or thirty minutes, that the cook removes the lid (with hungry children or spouses nipping at their heels) to discover the meal under-cooked! The only way to ensure that the Instant Pot is actually pressure cooking, and not saving your food from burning, is to look at the lid and see if the lock is up indicating internal pressure. Having to check this once the count-down starts turns set-it-and-forget-it to set-it-check-in-about-10-minutes-and-then-forget-it. Even though this is a negative, it shows how Instant Pot listens to its customers to improve future models. A previous model (IP-CSG) beeped loudly when the pot had not yet reached pressure in the pre-determined time and Instant Pot shared with us that the beeping alarmed the cooks who did not understand why the pot was beeping. We think a clear warning, signal light or message should be considered for future models. In the meantime, Instant Pot assured me that their next model, will have a more prominent lid lock- essentially turning it into a pressure signal. Results were satisfactory for our pressure cooking tests of steamed rice (using the manual setting with our standard timing and ratios), risotto, flan, potatoes and soup. However, more complex pressure cooking techniques (that bring the pressure cooker liquid content to the brink) like pasta in tomato sauce did not fare very well resulting with a scorched base. We did not test the cooking programs or cooking delay function. Instant Pot lets the cook choose one of three saute temperatures using the “Adjust” button to brown the food directly in the cooker. They are “Less” 275~302°F (135~150°C), “Normal”320~349°F (160~176°C), and “More” 347~410°F (175~210°C). As expected, the saute’ button only works when the lid is not in place. So it can be used both for saute as well as to reduce liquids once pressure cooking has completed. To pressure cook, the cook needs to move the valve of the lid to “sealing”. This is a bit tricky because the valve does not feel solid and, on occasion, we have placed it incorrectly. Next, the cook selects a cooking program or “Manual Mode” (where the cook chooses the time). Each key beeps as it is pressed. For each program, the cook can quickly push the “adjust” button for more or less recommended time or heat (depending on the program) – this button only works for a short time – then, adjustments can only be made by cancelling the program and re-selecting it. Once the “manual” pressure cooking mode is selected, the cook is shown 30 minute pressure cooking time – which can be adjusted by pushing the + or – buttons. Once the desired program and time are chosen, the LED display then shows “On” to signify the element is in the process of reaching the desired temperature. In about 8 minutes, a mechanical clicking sound alerts the cook that the lid locking mechanism is activated. Though, nearly invisible, a round hollow metal pin raises 1/8″ of an inch and can be seen in the hole behind the valve. Once pressure is reached, the display changes to begin counting down the remaining cooking time. When the time is completed the cooker beeps and the display automatically changes to “Keep Warm” mode, and the timer begins counting up showing the minutes with the letter “L” for low temperature. To open Instant Pot the cook can choose to open it via Normal Release -by moving the valve on the lid from “sealing” to “venting”; Natural Release – by pressing “cancel” and unplugging the unit. Or to keep the food warm at 145~165°F (62~74°C) for up to 10 hours. Removing the lid is a bit tricky. Common to most electric pressure cookers: the lid and the inner pot are connected – like a suction cup – via the gasket. So lifting the lid also lifts the inner pot. To break the seal, lightly tilt the lid at an angle. The next difficulty, common to electric pressure cookers of this body type, is a little dangerous to anyone standing nearby when the cooker is being opened. Some of the condensation, which is still super-hot, seems to hide in the nooks and crannies of the lid and could come dribbling out on any nearby hand, pet, or child – always handle the lid with caution. Once the cooker is open, turn it upside-down over the cooker (so any hot liquid goes back in the cooker) and place the on the counter inner-side up. We generally compare the pressure cooker being reviewed with ones in the same class. Since the Instant Pot is the first digital pressure cooker we’ve had for in-house testing, we roped-in the knowledgeable Barbara Schieving, of Barbara Bakes fame, who just launched a new pressure cooking blog. She followed the same testing procedure and gave us comparative data for her 1000Watt Cuisinart EPC-1200 pressure cooker to use in this review. Though both Instant Pot and Cusinart reached pressure at around the 11 minute mark, our tests had some surprising revelations. Instant Pot only had an average 2% evaporation during ten minutes of pressure cooking (compared to Cuisinart 4% and most stove top pressure cookers 3.5%) ! We used the Instant Pot several times a week for five months and have not experienced anything breaking or not working correctly during that time, nor have we received any direct reports of problems with this pressure cooker. The instant pot comes with a rice paddle, soup ladle, 6 oz ( 180 ml)measuring cup and extra-tall trivet. Some images and illustrations in this review are from Instant Pot and were used with permission. They include: Safety diagram, cross-section of encapsulated last-resort pressure release, control panel and pressure cooker accessories. It is important to note, that Instant Pot – as a company – has gone to great lengths to educate the public about electric pressure cookers. Their company website is a goldmine for anyone interested in learning more about electric pressure cookers. For example, the history of electric pressure cookers and comparison tests between their electric pressure cooker and a stove top working on an electric coil. Instant Pot has earned “Very Good” score from us for their feature set, stainless steel cooking insert, easy operation. Many of the dings it received are not exclusive to this brand, many of its peers suffer of similar problems like scorched tomato based recipes, the lid suctioning to the base, and condensation being trapped in the nooks and crannies of the lid. 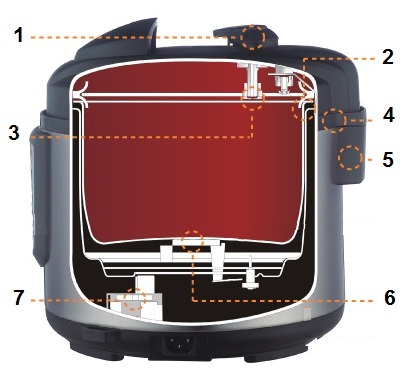 While a couple of other dings, like single pressure level and no-pressure alerts, Instant Pot assures me will be corrected in the next model – they release a new one every 12-18 months with new features and improvements. My new InstantPot Duo arrived yesterday. The first thing I have tried is the yogurt recipe. It was so easy compared to any method I have ever tried before! The yogurt is cooling in the refrigerator now. A couple of comments. Since this is the first time I tried yogurt (with fat-free milk) in a the Instant Pot Duo, I followed the recipe for making it in the liner precisely according to your video and the printed instructions, as I wasn’t sure of the forthcoming results. The 8 hours produced a yogurt that was slightly more tart than my preference. However, the texture is perfect. Next time I will try the 5 hours that I usually incubate yogurt. Also, I always drain the yogurt a bit to make it half way in consistency between regular and greek yogurt. I have had a Fagor 3 in1 multi-cooker for a few years. It has performed very well, so I have given it to my best friend to make way for the new Instant Pot Duo. Thanks for providing a discount for this amazing device and thanks also to your wonderful recipes and writings. I can’t wait to try many of the innovative cooking this device will provide. BTW, I spend several weeks a year in Italy (based about 2km from Portovenere, Liguria), so I love the Italian connection you bring to the blog. Our InstantPot Duo60 arrived right on schedule a month ago. I am very impressed so far with the thoughtful design and superb workmanship. Even the box & packaging were well-executed and it arrived without so much as a speck of dust anywhere on it, as if it had been packed in a cleanroom by a person wearing white gloves. It’s already become indispensable—we cook with it 3-5 times a week. Its “set-and-forget” ease of use and the speed with which it can cook even dried beans has greatly enhanced our household’s recent switch from the “standard American diet” to the WPBF (whole, plant-based food) nutrition choices recommended by books like “The China Study” (Campbell), “Preventing & Reversing Heart Disease” (Esselstyn) and Reversing Diabetes (Barnard). Healthy, whole-plant-based-food eating is much easier with the automated, built-in cycles of the electric InstantPot. I can honestly say it’s a working piece of kitchen art. Thank you for the review, the recipes, and the discount coupon. You’re welcome! Thanks for sharing those books and I’m so glad Instant Pot is helpful in your switch to a whole-food plant based diet!! Thank you for such a helpful website. I bought the Instant Pot Duo 6 quart after comparing a number of models. I’m no gourmet cook but was looking for something that takes less time. I never used a pressure cooker before but I have now cooked some of my best meals in it. I do look at recipes and use the preset cooking settings. With the presets you can still adjust. So if recipe says 20 mins and preset says 30 mins, I might change setting to 25 mins. I also love how it does not heat up the kitchen. I just made the best beef stew I’ve ever tasted and it took about an hour to make and cook. Rice comes out much better than my cheap rice cooker. I haven’t tried making yogurt yet but that will be my next project. I would recommend this cooker to anyone. I think enough people are not aware of the fact that you can change the times even on a “setting,” such as Meat or Poultry (or whatever it says). I do this regularly when I cook frozen chicken or a roast. In fact, that is one of our FAVORITE things about it!! I know I can’t be “IN LOVE” with an inanimate object, however, my Instant Pot comes the closest to anything I have ever owned! LOL! Have you tested the Instant Pot for canning? Their website says many users have successfully canned. I am specifically interested in pressure canning meats and vegetables, not just steam canning. Also, will a quart jar fit standing up? 2 jars? 3 jars? Love your product and would like to buy one but I need an 8qt. Any 8qt’s in the future? We’ve had our Instant Pot 6-1 for almost two years now- WOW! It’s the first and only pressure cooker we’ve ever owner because my husband is afraid of the stop top type and is positively certain they will blow up in the kitchen! That being said- I LOVE MY INSTANT POT! I wish I HAD TWO! I do have two inserts, and just sadly read somewhere that the NEW IP does not have the same size pot :(. As other readers have expressed, my only complaint is that it is not bigger. I would actually like an OVAL pressure cooker, as oftentimes when cooking cuts of meat I think it would be much handier. About cooking with it though: My HIP HOP PRESSURE COOKING COOKBOOK arrives today and I’ve heard it gives directions for BOTH kinds of pressure cookers, which I feel is going to make it a BEST SELLER. Knowing the author’s recipes are already tried, true, and delicious, but adding this one NECESSARY feature is certain to make it a standout. AMT has a PC CB which explains how to modify recipes for an EPC at the end of each recipe. I can’t begin to tell you how much I’ve learned from that cookbook, that I haven’t seen anywhere else on the web. My husband is equally in love with our Instant Pot. It’s really a darn shame I don’t work for them because I’ve sold enough of them just from people being in our kitchen! My Brother in law sent me the POWER COOKER you see advertised on TV, and I am very impressed with it! I already had three stovetop PC’s, 1-6 qt, 1-10 qt and a 16 qt canner/cooker which I use to cooker large amounts or to can with! I had gotten him interested in pressure cooking his venison and other game, and had told him I wouldn’t use an electric pressure cooker as a gift. Well, when it came, I tried my butter bean recipe in it and man, was I ever impressed! No having to watch it! Just punch a button and go watch TV ’till the bell went off, take the lid off and my beans wuz done. Next, I tried a roast! The cooking times were not right in their recipe book, which is a joke, by the way, but I added some time and it worked great. This thing amazes me. I would recommend it in a heartbeat but the books and the accessories are a waste of time an a ripoff! Update, I have since bought myself an instant pot, and this thing isthe best thing since Epsom salts. Much easier to use and clean, and it does a fantastic job, but I actually have to add a few minutes cooking times to meat because I want my meat to be well done. If I stick a fork in it and it moves or hellows, it ain’t done enough. If I wanted it raw, I wouldn’t need a stove or a pressure cooker, but my instant pot is the cat’s meow when it comes to cooking, just set it and forget it! I gave my mother an Instant Pot Duo 60 and gave it a try with just plain water and then cooked up a batch of pulled pork. Wow, the pork shredded easier than anytime I have ever done pulled pork before and only took 45 minutes! The IP-duo 60 is a fantastic cooking tool. The stainless steel pot is heavy and well contructed. I am looking forward to many meals from this unit. Thanks Laura for your information and reviews. It made my purchasing decsion much, much easier. Grazie!!! Thanks for sharing, and welcome to the fast side! After using the instant pot duo for a few items, pulled, pork, dulce de leche, basic meat ragu, mashed potatoes, and Fillipino style chicken adobo. I have more comments on the instant pot. 1) I noticed that the pressure lock didn’t pop up and into place when a large amount of steam was escaping from the lock valve. I feel the valve should have locked by then but the valve didn’t seem to want to pop up to seal the pot. By pushing down a bit on the lid holder tabs on either side of the lid, the pressure lock popped up and stayed in place. I had to do this on two seprate occasions. 2) Cooking the dulce de leche caused the adhesive from the can to form a goopy, soap resistant ring around the inside of the pot. Conventional cleaning was futile. I ended up putting the pot in the oven at 250 degrees F for about 5 mins. I pulled the pot out with hotpads and very easily wiped out the offending adhesive. Hope this tip helps other users who make the dulce de leche in their pressure cookers. 3) The instant pot duo has exceeded all of my expectations. The ease of use and the wonderfully flavorful dishes I can prepare after I am done working has really helped me stop eating out as frequently. With a delicious, hearty, ragu ready for pasta in less than an hour, you cannot fail! 4) I would not even consider another electric pressure cooker as the Instant Pot has thought of almost everything! jcn, you should not have to push, jiggle or otherwise shake the pressure cooker for the lid lock to come up with the cooker reaches pressure. Look straight down into the top of the lid and see if the metal (inside the lid) is aligned with the plastic (outside the lid). Instant Pot made a small batch of DUO’s a while back which had this hole mis-aligned. It’s easy to see because looking down in the hole you’ll see more metal on one side of the hole than the other. If that’s the case with yours contact them right away to get a new lid. 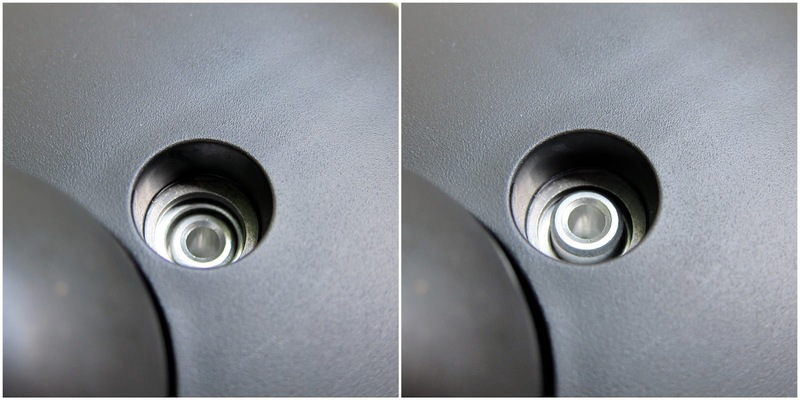 Jcn, when you look down into the valve from the top of the lid is the “inner” metal ring around the valve centered with the plastic outer-shell? Yes, I checked that out and it looks centered. Again, not sure what happened as it is still working fine. I finally had a chance to use the rice setting on the instant pot. I usually cook rice 1 cup at a time on my stove as I rarely need enough for more than 2 people. I needed 4 cups of rice and thought I would try the Instant pot Rice setting. Using a 1:1 H2O to rice ratio and simply pressing the rice button produced fantastic rice! I wonder if it would be practical to make less than 4 cups of cooked rice in the Insatnt pot as it does such a wonderful job. Set it and forget it pretty much. Another arrow in the instant pot quiver of usefullness!! I just got my Instant Pot today and have only ‘tested’ it – but am going to make my favorite Porcupine Meatballs tonight! I got my first pressure cooker when I was a newlywed, about 1970. I now have an induction cooktop and my old stainless pressure cooker doesn’t have a flat bottom, and will not work. I am replacing my pressure cooker, my slow cooker and my rice cooker with this new pot – no sense in having all of the pots on my shelf! I make one to two cups (these cups are smaller than an 8 oz cup) in the rice cooker all the time and it is simple – just rinse the rice and add water! I haven’t cooked any on the stove for many years. I do NOT miss that! I started cooking it in the microwave in the 1980’s and got my first rice cooker about 15 years ago. The newer clamping models are similar to the pressure cooker style and it is amazing how simple it is! Is that right this earlier version of the InstaPot cooks at 105.6C? That’s only equivalent of maybe 3psi?? I have one of the even earlier version, the 5-in-1, and it doesn’t seem to take measurably longer than other electric PCs. Yes, that was the maximum temperature registered during the test. 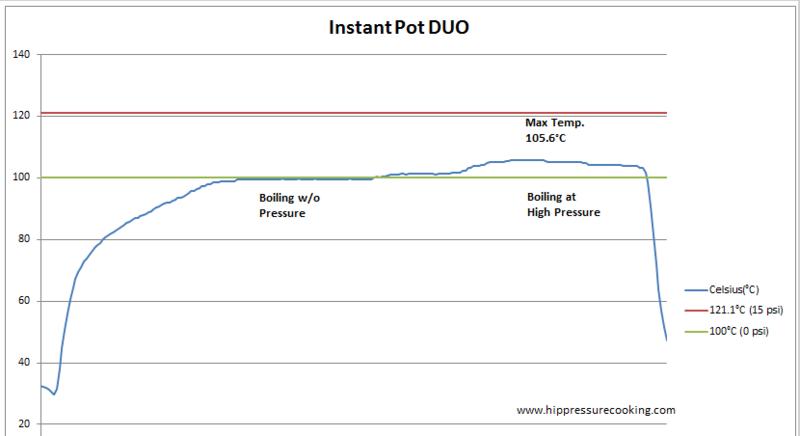 You can click on the temperature to see the chart – I have made one for almost every pressure cooker reviewed. This, and a few earlier charts, are retroactive which means that I added the results after the reviews were made and published. Which is why the test results are not mentioned in the “performance” section. My husband and I bought an Instant Pot 7- in 1 in December. Can’t say that he was overly thrilled about buying one being as we had just ordered the 6 quart Kitchen Aid stand mixer that I’ve been wanting for 30 years. But, being as my birthday, anniversary and Christmas are all in the same month, he went ahead and ordered it. I’ve always been intrigued by pressure cookers but the stove top ones scared me. I get sidetracked so easily and I could just see myself forgetting about it and the pot exploding, going through the ceiling and sending the stove through the floor! But I stumbled across an article about electric pressure cookers on the Kitchen or Sweethome site and thought maybe one of those would be safe for the easily distracted to use. Well, it is. And the husbànd adores it. We’ve used it, on average, every two to three days since we got it. I love that I can presoak beans it in under 30 minutes. I never could remember to presoak them the night before. I love that I can saute in the Instant Pot. All of our favorite recipes seem to be more flavorful when cooked in it. Meat seems to taste better. My daughter doesn’t like chicken. I made a soup with chicken in it. She ate it and asked her dad what kind of meat mom used in the soup. He told her chicken. She called me to verify what he said…..she simply could not believe that it was chicken! We’ve hard boiled eggs in it and they were great. Nine minutes, start to finish. Another thing that we love about it, is that you don’t heat up the whole house when you’re cooking. We live in the deep South and when it’s a hundred degrees outside and your air conditioner is struggling to keep up, the last thing you want to do is be in a hot kitchen for an hour or two! You also don’t end up having to smell what you cooked for dinner for hours after you’ve eaten! 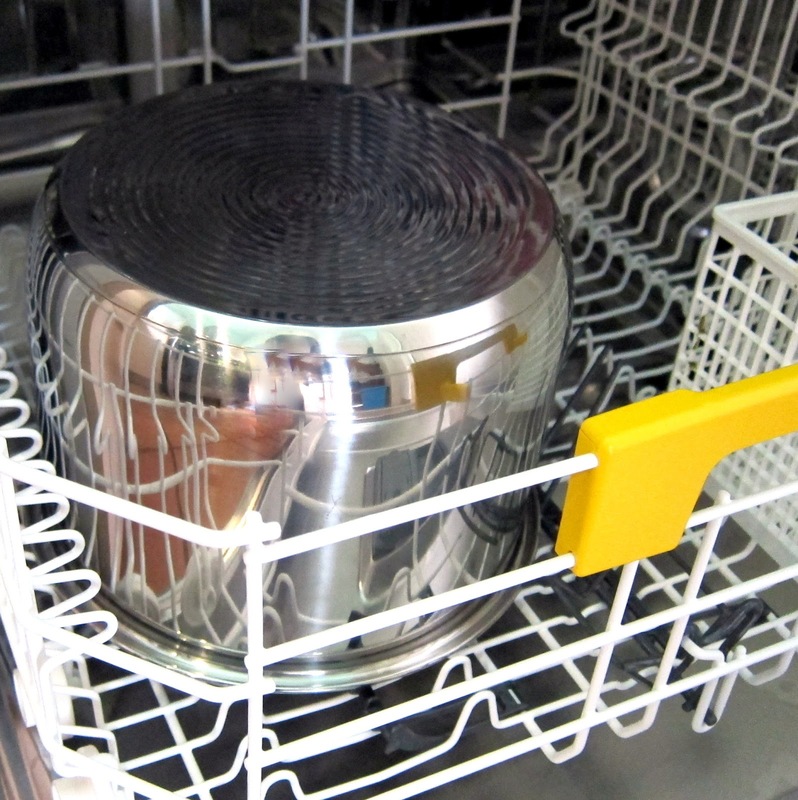 The stainless steel insert is great……I don’t like or trust teflon. I have found it quite easy to clean. I’ve gotten a film that didn’t seem to want to wash off of the interior of the insert a couple of times but a squirt of Dawn dishwashing liquid and some white vinegar in the water and letting it soak for 10 or 15 minutes and it came right off. Thus far, I have no complaints about this unit. I have recommended it to quite a few people and the husband tells people about it all the time. Wish I had owned one of these when my kids were young! Peacemaker41, what recipe book(s) do you recommend? Apart from that, I have found Lorna Sass’s books worthwhile. I have, and like, Pressure Perfect. Jimmie, I actually use a combination of old cookbooks that were put out by our church many years. It had many regular recipes, Mama’s included, that many of the old timers in our church used over the years. Being a minister for many years, and traveling the country in revivals, the recipes are mostly recipes used by old timers from all around the country, Arizona, Alabama, Tennessee, Georgia, Texas, Louisanna and Illinois, and others! The butter bean recipe was Mama’s, the pre soaking method using the microwave my wife’s. Since pressure cooking is completely different from stovetop, a few changes are needful, the greatest being the amount of water or liquids need, and cooking time. If you need more info on that, HIP PRESSURE COOKING has some great info. Please see my amazon review. There is a product safety issue that I am concerned about. I got a stainless steel pot that came apart in my food. I have included photos here an at the Amazon review. I just learned the same thing happened a week after I asked Amazon to insure this got priority as a product safety concern. Thanks for your note and photo Wanda – I just sent an e-mail to my Instant Pot contact to find out if they’ve been getting many reports of this and what the cause could be. It looks like the bases were polished incorrectly (too deeply) in some spots according to the photos you included on amazon and a corrosive material was dribbled in others according to the photo here. I will come back and post with the answer I get from my Instant Pot contact. I have five 6L stainless steel inner pots, and one 8L inner pot ( a few I’ve used for over two years) and none of them have this kind of damage. That is to say, perhaps it was a bad batch. It is unfortunate to hear that multiple people have experienced this. Wanda, Instant Pot got back to me and told me that they take this report very seriously and are investigating the matter. My contact there is pretty high-up in the organization so I have faith that he’ll get to the bottom of it. I have passed your e-mail address on to Instant Pot so they can research the matter thoroughly – they were having problems locating you through the amazon username used in your review. Over the last few years, I ve been simplifying and reducing the tools and appliances in our kitchen and only keeping the ones we use often. In fact, our kitchen now has a simple assortment of unusual appliances and tools that we use every day. One appliance that has recently earned its place on the list is the Instant Pot . My inner pot is too tall for my lid to close. I just received this for christmas. The lid will lock and close if the inner pot is taken out. What am I doing wrong? It sounds like there is either something is stuck under the inner pot, or Instant Pot for some reason included the wrong size for your pressure cooker. I love my Instant Pot but I have found that the slow cooker functions simply does not work. I’ve tried several times with disappointing results. My friends with Instant Pots have shared the same frustration. Are we all doing something wrong? I prefer to pressure cook because of time, but sometimes a slow cooked meal actually works best for a long day away from home with a short window before bedtime, after arriving home. Thanks for any thoughts you may have! So we bought this 8 qt 6 in 1 Instapot not knowing it was an older style. Good price of $65 for unit. I have never cooked this way and was wondering if you think we should return this and opt or a newer version as new ‘pressure cooker people’?